We Help War Victims is the only NGO that has provided villages in Phongsali Province with area clearance and rapid response. More than fifteen years ago, nine of eighteen Lao provinces were chosen to get priority over other less contaminated provinces. Although funding has increased dramatically, long-neglected provinces like Phongsali are still without help. We Help War Victims, Inc. is calling for the US State Department Office of Weapons Removal and Abatement to advocate that future US funding be distributed in a manner that benefits all contaminated provinces. 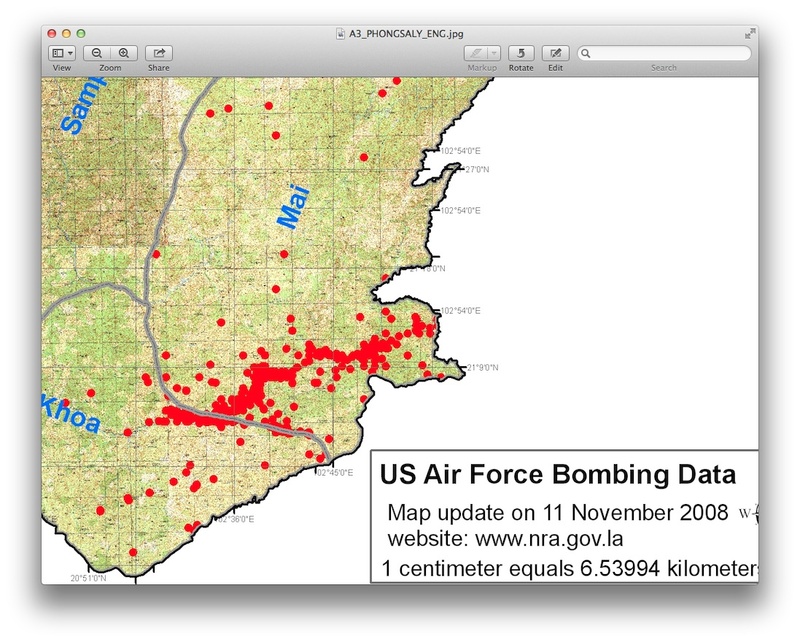 Here’s a map showing the pattern of bombing in Phongsali Province. Yet, this province has never been approved to receive UXO removal by UXO/LAO, MAG, Halo, Norwegian Peoples’ Aid or any other humanitarian organization that has functioned here. The only help that Phongsali villagers have received in forty years was from WHWV during four consecutive dry-season projects. (Projects conducted without Lao government approval). More than fifteen years ago, when international funding was almost nil, Laos performed triage and chose to put all efforts and funds into the nine most contaminated provinces and to delay work in other provinces until funding increased. In my sixteen years here I’ve seen US funds doubled and doubled and doubled again. But…still not a dime to those long-neglected provinces. I’m pleased to hear that President Obama advocates doing more to remove the blight of UXO from Laos, but I’ll bet he doesn’t know that our current funding only aids 9 of 18 provinces here. It wouldn’t surprise me to learn that our State Department Office of Weapons Removal and Abatement hasn’t got a clue. It’s not as if no one has asked. Danish Church Aid, learning of WHWV work in Phongsali, requested funds from the US to perform UXO clearance and “rapid response” to villager-discovered ordnance. That request was denied and funds went…where? Where they’ve always gone—to the same nine provinces that were selected more than fifteen years ago when US funding was a fraction of what it is today.